Chicken pot pie is my ultimate comfort food. It is one of those foods I have eaten my entire life and never seem to get sick of or grow out of. When I was younger I used to love chicken pot pie that was topped with big fluffy biscuits – not homemade biscuits but the kind that comes in a tube – you know the Pillsbury Grand biscuits? Amazing. This chicken pot pie is slightly more elevated but just as good, I promise. Instead of a biscuit topping this recipe calls for a filo dough topping. Filo is a dough that is made up of very thin layers and is usually used for making pastries like baklava. In this recipe the filo is layered together with melted butter and placed on top of the pot pie filling. The result is a crispy and crunchy topping that goes together perfectly with a hearty pot pie filling. I baked my pot pies in mini cocottes, but a Dutch oven would work just as well. Make sure to let your Dutch oven cool slightly before placing the filo topping. 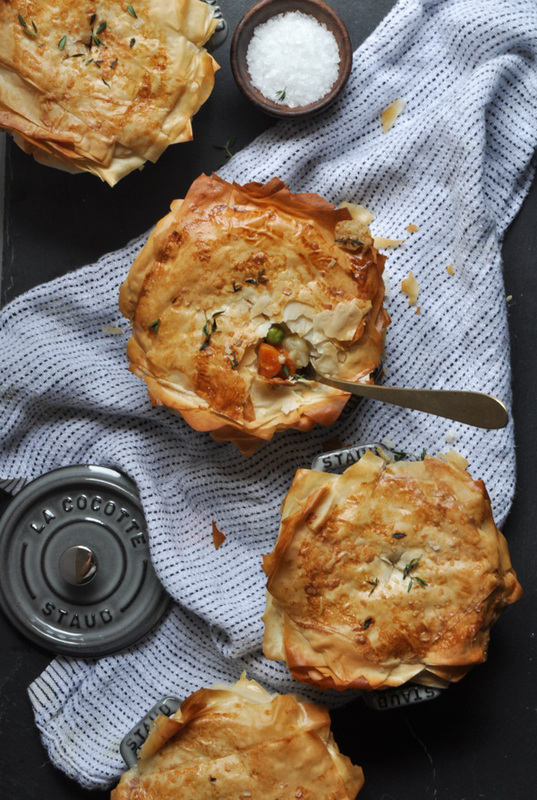 Also, feel free to swap the filo dough topping with puffed pastry or even those good old-fashioned Grands biscuits, either way this pot pie will be delicious. In a Dutch oven or large pot over medium heat, melt the butter. Add the flour and cook, stirring constantly, until the mixture smells fragrant and turns light brown, about 2 minutes. Whisk in the white wine and demi-glace. Slowly add the chicken stock, whisking until smooth, and bring to a boil. Add the onion, celery, carrots, potatoes, chicken, thyme, bay leaf and a large pinch of salt and pepper and cook until the vegetables are almost tender, about 15 to 20 minutes. Remove from the heat and discard the bay leaf. Divide filling among 8 cocottes or allow the filling to cool in the Dutch oven. To assemble the pot pie gently unroll the filo. Cut the filo in half and use remaining filo for another use or re-freeze. If using cocottes, cut squares large enough to cover the tops of the cocottes. Brush melted butter in between each layer, using about 10 – 15 squares per cocotte. If using Dutch oven, do not cut into squares, instead brush filo dough layers with melted butter and place on Dutch oven fanning out layers to cover the entire top of dutch oven. Trim filo if necessary. In a small bowl whisk egg and 1 tsp. water. Brush the filo with the egg wash, sprinkle with sea salt and cut a small hole in top of filo to let steam escape. Bake chicken pot pie until the filo is crisp and browned all over, about 15 to 20 minutes. Remove from the oven and let cool about 10 minutes before serving. TIP: This is a great make ahead recipe. You can make the filling up to 2 days before and store in the refrigerator or freeze for up 2 weeks but defrost before using. When ready to eat top the filling with filo dough, bake and enjoy!